Pork chops are one of the easiest meats to grill. Like beef, pork chops should be grilled hot and fast. The biggest problem some people have is overcooking the pork chops on the grill. If the chops are overcooked, you will end up with a dried out chop. To avoid this problem, you will need two things: good timing and a good meat thermometer. This table provides a good starting point for the overall cook time. 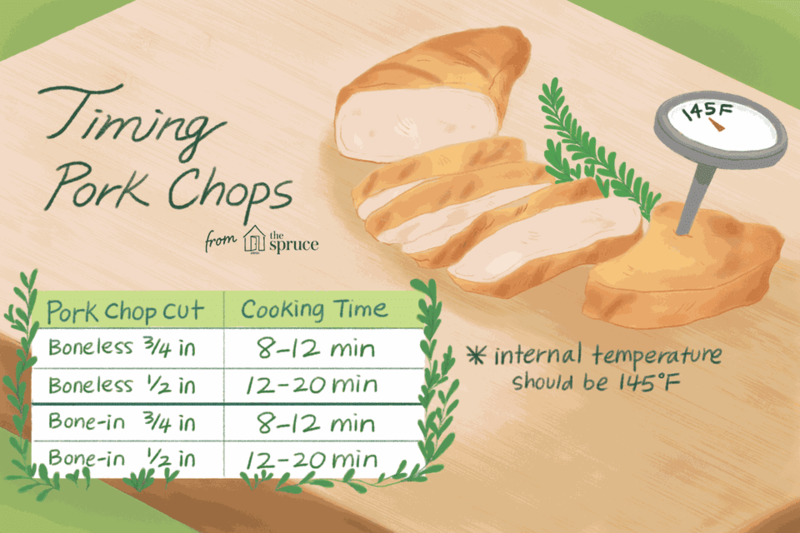 If you use a thermometer along with this guide, your pork chop will be grilled to juicy perfection. The following tips provide a good step-by-step guide to correctly cooking pork chops, either on the grill or with a broiler. Preheat the grill or broiler to high. Take time and allow it to come up to its hottest temperature. If you are using a broiler, the meat should be 4 to 5 inches away from the heat. On a grill, the chop should go on the hottest part of the cooking grate over direct heat. Whether grilling or broiling, turn the pork chops over half way through the cooking time to get them cooked evenly. Watch the clock and the temperature. Test the temperature near the end of the cooking time. To test a pork chop with a meat thermometer, insert the tool through the side right to the middle of the meat. This is the coldest part of the chop. Once the temperature reaches 140 F (60 C), remove the chops from the grill or broiler and place them on a warm plate. Cover with aluminum foil and allow the chops to rest for 5 minutes. During the resting time, the juices and heat will distribute evenly, bringing the final temperature up to 145 F (65 C), which is a safe temperature for pork. The resting time will also allow the juices to redistribute through the meat, which makes for a very juicy chop. All cooking times listed are approximate. Different grills will cook at different rates. Consider these times as a general guide and trust your experience and a reliable thermometer more than your watch. Successful grilling, like other forms of cooking, is based on experience. The more you grill, the better you get at it. Grilled pork chops pair well with a wide variety of side dishes. Serve the chops with classic barbecue favorites like beans, cornbread, and coleslaw. You could also try going the tropical route by serving the chops with mango chutney and flavorful rice dish. Grilled pork chops are a versatile protein that works with most other foods.